The first thing he found was a Bi-Coloured-Python-Rock-Snake curled round a rock. "'Scuse me," said the Elephant's Child most politely, "but have you seen such a thing as a Crocodile in these promiscuous parts?" "Have I seen a Crocodile?" said the Bi-Coloured-Python-Rock-Snake, in a voice of dretful scorn. "What will you ask me next?" "'Scuse me," said the Elephant's Child, "but could you kindly tell me what he has for dinner?" While doing my PhD in Zoology at Otago, I had my own show on Radio One, the student radio station. Every Sunday morning from 9-11am the Inner Mongolia A and A Good Time Kiddie Show would hit the Dunedin airways with 'fun, jokes, songs and laughter - so don't turn off the radio or we'll tell Uncle Genghis'. I did the show with Alison (the other A), who was a schoolfriend of my sister, and we had a lot of fun. We even had an audience of kids who would ring in with requests. One of the coolest stories that we played was from a record of Rudyard Kipling's Just So Stories where Bobby McFerrin provided the music and sound effects and Jack Nicholson provided the narration. If you have kids you owe it to them to find these audio stories. My favorite story was The Elephant's Child which explained how the elephant got his trunk. 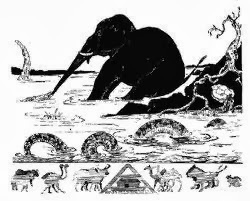 The Elephant's Child (full of 'satiable curiosity - he must have been a budding scientist), on the advice of the Kolokolo bird heads to the banks of the great grey-green, greasy Limpopo River, all set about with fever-trees, to find out what the Crocodile eats. Complications ensue. Luckily, a Bi-Coloured-Python-Rock-Snake is on the scene to help rescue the Elephant's Child from the Crocodile who has grabbed hold of his nose, which stretches out to become a trunk. It's a great story, expertly told, and any time I hear the word 'python' I can hear Jack Nicholson with Bobby McFerrin warbling in the background. The Elephant's Child's question is a good one. Finding out what animals eat is an important part of ecology and behaviour. Unfortunately, we can't just walk up and ask our animal like the Elephant's Child did. There are several methods that we can use. We can observe animals and see what they put into their mouth (but that only works for obvious species in well lit areas). We can look at what we find in scats (but we have to find the scats). We can stomach pump to bring food up (but we have to capture the species). If the animal is dead, we can cut open the digestive system and see what we find (but we have to find the dead individual). Increasingly, DNA is being used to identify the anonymous chunks of tissue that can be found in stomachs or scats. We have a number of studies looking at this issue in our department including figuring out what fish species fur seals eat, what carnivorous snails like to munch on and what cats get up to when they are away foraging. 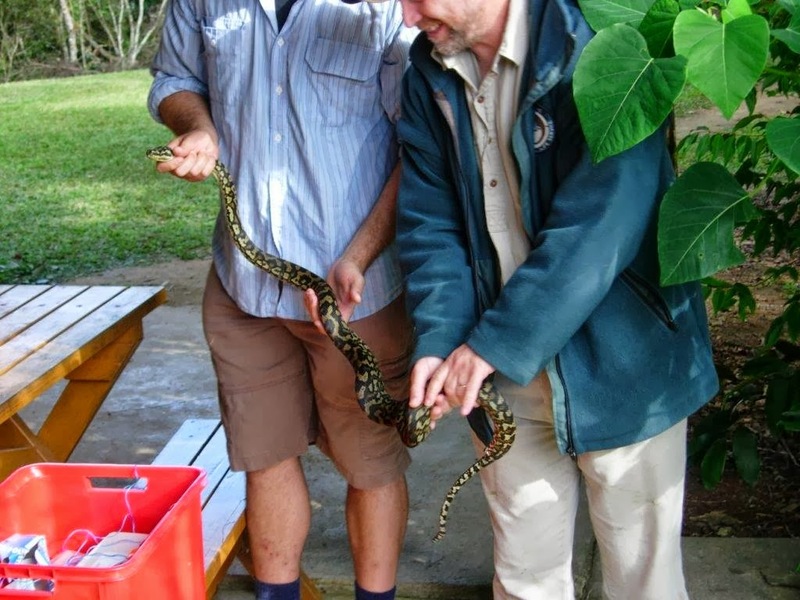 Tim Curran, a recent arrival from Australia, was part of a study that looked at what pythons eat, not Bi-Coloured-Python-Rock-Snakes but the Carpet Python (Morelia spilota) from northern Queensland. This study was published recently in Australian Mammalogy and included former Lincoln University ecology technician Alastair Freeman (or Spot) as well as colleagues Jennifer Fill and Georganna Story. On November 21, 2006 a 2 metre carpet python did not make it across a dirt road in remnant rain forest near Yungabarra, Queensland. This was rather unfortunate for the python but useful for the scientists who found it. The python was added to a study that looked at gut contents from 51 similarly road-safety challanged snakes. Overall, there were at least 17 different mammal species found in these python stomachs. Our snake from Yungabarra was of particular interest as it contained hairs that were found to be from a cryptic species of tree mouse (from the Pogonomys genus). Mammal hairs from different species have unique structures when examined under a microcope allowing species to be identified. A species is known as cryptic, in ecological work, if it is difficult to locate. Although Pogonomys is known to be in the general area of the Atherton Highlands it is seldom recorded in monitoring studies as individuals are difficult to live trap. Tree mice spend a lot of time foraging in the tree canopy zone and the rest of the time in underground colonies. It is not clear whether this snake caught the tree mouse in its burrow or up in the tree as carpet pythons hunt in both areas, but it does confirm the presence of this mammal species where other methods haven't. Ecologists are increasingly making use of predators as sampling tools. Owl pellets and cat scats can provide important information about what lives in an area (and their relative abundance) by taking advantage of a 'data collector' that can actively find cryptic prey. Snake gut samples can now be added to this list. Rather than asking the crocodile what it eats, the Elephant's Child could have watched and observed what the croc ate, he could have waited and observed what came out of the croc in the Reptile Restroom, or, if a crocodile hunter had been in the area, he could have examined the croc's stomach contents. That might have made for a less interesting 'Just So' story (and elephants would not have ended up with a long truck) but it might have better sated his 'satiable curiosity' in a more approved health and safety manner.